Scott Jordan likes to call himself "The Sixth Shark" for the way he handled himself in the Shark Tank. In fact, he even wrote a few articles for SharkTankBlog as the "Sixth Shark." Scott's infamous online feud with Billionaire Mark Cuban made quite a buzz in season three. The two squared off on the patent issue. Jordan pitched his Technology Enabled Clothing, the licensing arm of his business. 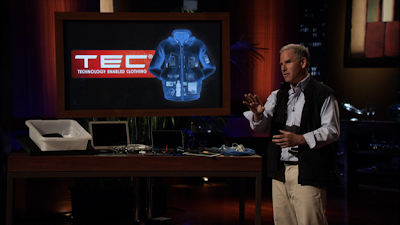 He makes most of his money selling ScottEvests, a line of outer wear designed to safely carry and protect various technological gadgets. "No. No ketchup for me." It's a good thing mustard isn't patented!